The Hidden Garden and Linda Howard's wedding design prowess are on full display in this overview photograph from Erica and Justin's Skirball Cultural Center wedding featured by Inside Weddings Magazine in their Summer 2015 issue. 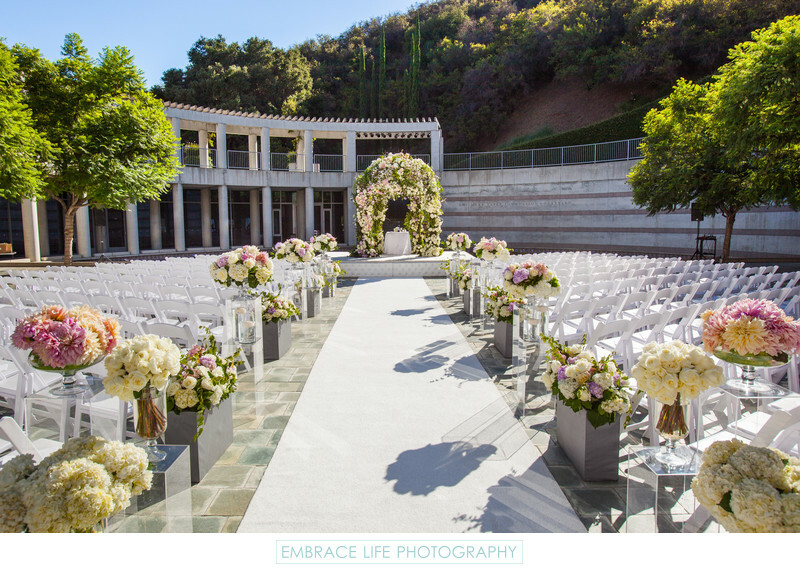 Taper Courtyard at Skirball is a truly impressive Los Angeles wedding ceremony location. Set against a mountain backdrop, the courtyard's distinctive shape, neutral, modern concrete and stone structure, and lovely water lily blanketed reflecting pool provide the foundation for this striking wedding ceremony decor including: tall, acrylic flower stands; modern, gray, rectangular flower boxes; a creative assortment of glass vases; beautiful flower arrangements; a white aisle runner and the breathtaking garden inspired chuppah (Jewish wedding canopy) by the extremely talented Hidden Garden.